This GE washer repair guide will help you in repairing three basic types of GE washers: GE HydroWave washer models, GE front-loading washer models and the GE T model washers. The T model washers came out in the early to mid nineties and is still made today in limited models. Note that T model will not be written on your washer anywhere, this is just a term that techs use to identify these washers. The HydroWave is GE’s newer top-load washer as it came out around 2006. It makes up most of GE’s top-loading washer model lines but there are some models that are still the T model style. GE front-loading washers became popular around 2005 and are still going strong today. It is important to know if your washer is a T model or a HydroWave before attempting a GE washer repair. Although they look exactly alike, they are very different in many ways. The easiest and simplest way to distinguish between the two models is to open the lid and attempt to turn the tub by hand. If the tub will turn freely you have a GE HydroWave and if you cannot turn the tub then you have a T model. The reason for this is the T models have a mechanical brake that holds the tub in place anytime the motor isn’t turning in spin direction. 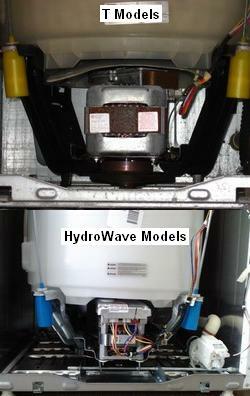 The HydroWave models have electrical brakes that are only engaged to stop the tub when the lid is opened during spin. Another way to tell if you have a T model or a HydroWave model is to look at the motor. The T models the wires are plugged into one wire harness. HydroWave models have five different plugs on the front of the motor. Although these two models are different in many ways, disassembly is the same and this page has step-by-step instructions on how this is done. This section is for GE HydroWave models only. These pages talk about GE washer motor diagnostics for the HydroWave models as well as other problems such as lid switch testing and fuse testing. This section was designated for the T models but a lot of the information is still good for the Hydrowave models since they use the same lid switches, agitator coupling as well as the same water level controls on some models. Please note that none of these pages contain information that pertains to the high efficiency HydroWave Models. GE front-loading washer repair can be complex at times because of all the electronics. However, this GE washer repair guide is here to help. Choose the link below that best describes the problem your washer has.